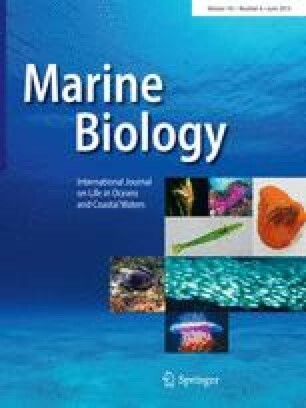 Five species of the marine insect Halobates share similar ecology but have distinct biogeographic ranges in the eastern tropical Pacific, a region from approximately 75°W–160°W and 10°S–35°N. Between 2001 and 2010, the Sea Education Association collected Halobates from 682 neuston tows (surface net 1 m × 0.5 m, 335-μm mesh) during fifteen cruises between San Diego, USA, Mexico and Tahiti. Total Halobates spp. densities varied substantially from year to year, but our data do not show a sustained change from a data set collected 40 years earlier from 1967 to 1968 (Cheng and Shulenberger in Fish Bull 78(3):579–591, 1980). Halobates are sensitive to sea surface temperature and we observed significant differences in species distributions over time, but these were not due to differences in water temperature or climate change. Our analyses show that the patterns observed are attributable to substantial but previously undescribed seasonal shifts that occur each year in the ranges for both Halobates sobrinus and Halobates micans. There is substantial overlap in ranges during seasonal shifts, but very little co-occurrence of H. sobrinus and H. micans in individual net tows, suggesting biological mechanisms rather than physical factors are restricting distribution and co-occurrence of these two species. Communicated by M. G. Chapman. This work would never have occurred without many hardworking students and staff at SEA. We would like to thank them for the numerous hours spent sorting Halobates from neuston net tows. This work was partially supported by NSF Grant OCE-0087528. Internship support to L. Correia for this project was provided by Howard Hughes Medical Institute and Washington and Jefferson College.